Between 1962 and 1966 I attended Highland Park High School in Highland Park, IL. I was a math-minded person and even though it was the only language spoken at home, I was definitely challenged when it came to English class. Part of the problem was that I had poor study habits, an issue that my parents helped me correct by hiring a teacher, Vernon Hein, to get me on track. The summer after the Freshman year, they also made me take a workshop run by Mr. Hein and Mr. William Guthrie--perhaps the most feared English teacher in the school. In that course we had to learn 20 vocabulary words (including "heinous" -- Mr. Hein was asking for trouble with that one), and also write a short essay every day. I became "expert" at 3-3-3. Fast forward to my Freshman year at Carnegie Institute of Technology in Pittsburgh. I noticed that every Sunday, while others were struggling to get their English homework done, I had most of the day free because I was finished. I didn't think anything of this until near the end of the year. I flew to Chicago after class on Thursday in first class on United Airlines ($14.70 each way using youth fare) for my interview the next day and then back to Pittsburgh on Sunday. In spite of my best intentions (really) I only managed to read about 100 pages by Monday morning. Although I never used them, I figured Cliff Notes would save me. 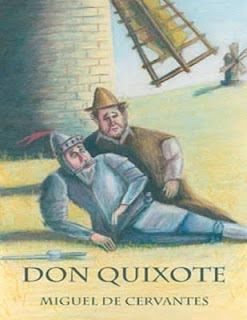 I spent a few hours checking local bookstores for them and none had Don Quixote. I was royally screwed. Or was I? On Monday night I started quickly scanning the book to locate three sections that I might use to support one of the supplied topics. After not too long I found them and read only those sections in any detail. I wrote three paragraphs of three sentences about each. Although I felt guilty about not having read the book, I turned it in and hoped for the best. On Thursday morning Dr. Demarest returned the essay to me marked with an A! Years later, when I returned to the now named Carnegie Mellon University as a researcher I would occasionally see Dave Demarast on campus. One day I told him this story and we had a good laugh about it. To this day I blame the English department at HPHS and 3-3-3 for any success I've had in writing.